Steel safety bollards are useful to protect equipment or property from motorized traffic. They protect people as well. Strategically placed they can also direct traffic flow and disallow certain equipment within an area. 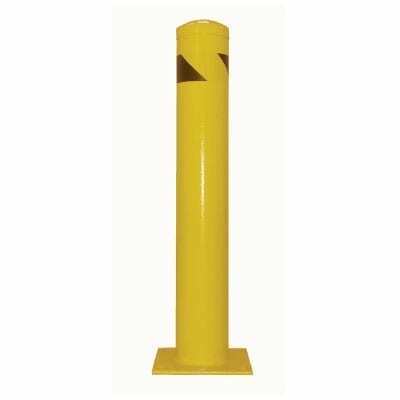 Powder coated safety yellow and anchored to the floor with expansion anchors the Mighty Rail bollard is highly visible and solid. The best seller is the 4-1/2” x 42” unit for standard duty. Other sizes and duties available. Mount Plate 8" x 8" x 3/8"
Mount Plate 10" x 10" x 3/8"